We've been working for months, gearing up for Christian Fashion Week 2014. We are so excited to announce our new website as well as releasing the tentative dates for this coming annual show. Celebrate this year for a full week, February 2nd - 8th! We are kicking it off with an international call for prayer for the art and fashion world and building up to a two-night spectacular showcase of talent from around the world. We've been working hard behind the scenes getting everything finalized. From the venue to our designer line up, the team has been working as hard as ever to produce what we are sure will be the best produced fashion show we've ever done. Don't be fooled by imitators - there's only one Christian Fashion Week, and you can find all the information about it right here! We've also expanded our Backstage system to handle all designer, sponsor, exhibitor, model, and media registrations online. You can do everything from submitting your information to uploading you high resolution logo for inclusion in our publicity and promotions. Also, take special note of the new Christian Fashion Fund, a special program to help fund modest fashion lines by talented designers. Designers are invited to apply, and those wanting to sponsor modest fashion are encouraged to donate towards the fund. There's tons more to come, so stay tuned! Christian Fashion Week 2013 Was A Success! Over two years ago, we envisioned a fashion week that wouldfeature modest yet fashionable garments specifically designed with the Christiancommunity in mind. Last Saturday, February 9, we made history as we put on theshow of our lives. 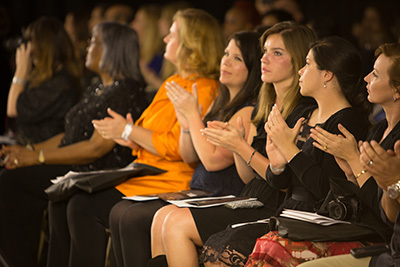 Nine designers from all walks of life and career showcased theircollections for an audience of over 300 attendees and over 2,000 online viewers. Over two years ago, we envisioned a fashion week that would feature modest yet fashionable garments specifically designed with the Christian community in mind. Last Saturday, February 9, we made history as we put on the show of our lives. Nine designers from all walks of life and career showcased their collections for an audience of over 300 attendees and over 2,000 online viewers. The event truly felt like New York in Tampa models walked the runway in everything from swimwear to Indian-inspired pieces. We are so looking forward to next year. But, stay tuned for images from this year's show. If you want to see images right away, visit our Facebook Page. This weekend, the highly anticipated Christian Fashion Week 2013 promises to deliver a stylish, high profile event that is sure to set the standard for modest fashion. The weekend begins with a VIP reception on Friday night and builds up to the main events starting at 5pm on Saturday. The weekend designer lineup includes celebrity designers such as Carmelita Couture as well as debut collections from the prodigious Julia Chew and an exclusive swimwear segment by Renee Scarborough of Two Coconuts Swimwear. "We've definitely hit a nerve," said Jose Gomez, co-founder of the event and president of the Fashion Industry Association. "We are so proud of our designers and overwhelmed by the response we've received from both the Christian and secular community. Zondervan Publishing has played such a critical role in our momentum and we cannot be more thankful for their partnership. We love the fact that our VIPs will be receiving a new StyleLine Bible in the swag bags. You won't see that at New York Fashion Week!" The VIP reception, which is limited to VIP ticketholders and event participants, begins at 7pm on Friday, February 8. The event will be held at the Bayanihan Arts and Events Center located at 14301 Nine Eagles Drive, Tampa, FL 33626. Doors for the main event open at 5pm on Saturday, February 9. The first show of the night, an interactive women-only swimwear segment, will begin at 6pm. At 7:30pm, Christian Fashion Week's main show will begin. Eight world-class designers - Alma Vidovic, Carmelita Couture, Evelyn Lambert, Franco Montoro, Julia Chew, Pat McGhee, Sandra Hagan, and Sumita Bhojwani - will showcase their new collections. From bridal to evening wear, the night promises to deliver non-stop fashion with a modest yet stylish flair. The vision of Christian Fashion Week is to create the world's first series of fashion shows and events around the idea of fashion with a Christian worldview, considering Christian values such as modesty, boldness, and true style. We aim to create a viable forum for fashion designers and industry professionals to network and increase awareness of a values-based fashion industry that has always taken a back seat to the world's more risqué sense of style. Christian Fashion Week is a mission to stand for dignity on behalf of communities, families, and fashion consumers. A late addition to the all-star fashion designer team slated to be featured at Christian Fashion Week 2013, Renee Scarborough, owner and designer of Two Coconuts Swimwear, has been announced as the sole designer for the special women-only swimwear segment. The segment has already turned heads outside and inside of the Christian community, with some questioning the decision to exclude a male audience. The organizers of CFW have promised it will be an "interactive" segment, allowing audience members a close look at the garments and fabrics to make informed buying decisions. "We want this segment to be as comfortable as possible for our audience," stated Tamy Lugo, co-founder of Christian Fashion Week, fashion blogger, and stylist/owner of VStylist. "With a strictly women audience, you can do things that would otherwise feel awkward. For example, in this segment the models will literally be coming off the runway and allowing the audience to closely examine the fabric and feel of the garments. It would be a bit awkward for Pastor Joe Smith to be standing there as his wife 'researches' her next swimwear purchase." Scarborough is eager to demonstrate her versatility as a designer for "real" women. "I want all women to see they can feel beautiful and glamorous in my swimwear at the beach or the pool side, regardless of imperfections." Renee Scarborough is the Owner/Designer of Two Coconuts Swimwear. As a Florida native Renee spent countless days on the sunny shores of the Gulf of Mexico. With time, she began to notice flaws in swimwear designs and sought to create new designs with three main goals in mind - to look beautiful, fit perfectly, and stand out from the status quo. In 2006, Two Coconuts Swimwear was created. Scarborough has expanded and added dresses and resort wear to her collections that have been featured in numerous publications while receiving accolades on radio and television. With clients worldwide, including New Zealand , Europe and Latin America, her designs are celebrated by a diverse audience. As February 9th approaches, the Christian Fashion Week team prepares its designers, stylists, volunteers, partners, and registered media for an industry first. While fashion shows are not a new thing to churches, this is the first time in history an organized effort to hold a Fashion Week event from a worldview of modesty and faith has ever been attempted. As a result, the event has begun to take on the form of a movement instead of just another show. With supporters inside and outside of the church community including celebrities and fashion industry professionals, Christian Fashion Week has promised a well-produced event with a strict focus on fashion and buyer participation. "This event is far from what people have come to expect from Christian-led events," said Mayra Gomez, co-founder of Christian Fashion Week. Co-founder Wil Lugo added, "It's not a church service. It's a celebration of fashion from the perspective of our values and tastes as a community of faith and modesty. We've got international and celebrity designers who have spent months preparing fashion lines that are going to wow the crowd." Designers Alma Vidovic, Carmelita Couture, Evelyn Lambert, Franco Montoro, Julia Chew, Pat Mcghee, Sandra Hagen, and Sumita Bhojwani are making their final adjustments to their stunning collections, showcase for the first time at the February 9th event. When asked about why she chose to participate in Christian Fashion Week, designer Sandra Hagen said, "I want to reach other markets in the Fashion Industry as well as to show women a new side of elegance and style." Designer Julia Chew smiled as she chimed in, "I am motivated to design garments that promote the femininity, dignity, and loveliness of a lady." A late addition includes a men's line by Fashion Week veteran, Pat McGhee. With one month left before the first Christian Fashion Week in history, CFW announces its full designer line up for 2013. The show, scheduled for February 9, will feature an impressive mixture of couture fashions designed with modesty in mind. Featured designers include Carmelita Couture, Evelyn Lambert, Franco Montoro, the ethereal Julia Chew, Sandra Hagan, and Sumita Bhojwani. The latest addition to the line-up also includes a debut bridal collection from celebrity stylist, Alma Vidovic. "The buzz about Christian Fashion Week has grown to what I call a 'heart cry'," said Jose Gomez, co-founder of Christian Fashion Week and President of the Fashion Industry Association. "People are expressing gratitude that an event like this even exists, and that they have hoped for someone to create fashion they could be proud of wearing as modest men and women." Alma Vidovic is a bridal designer specializing in sophisticated, eclectic, and timeless bridal gowns designed to tell a visual story. Carmelita Couture is a clothing line that is created by Divine inspiration, offering a tantalizing visual that awakens the spiritual. Evelyn Lambert is a New York-based designer who brings classic style with innovative design for women on the go looking for quality clothing and endurance. Venezuelan-born Franco Montoro is a global, fashion trend setting icon. He was nominated for Best Avant-Garde Designer where he ranked third in this category. Dreamy, ethereal dresses are the core of Julia Chew's design aesthetic. Fashion designer, stylist, artist of clothing that is timeless and feminine, beautifully made inside and out, Sandra Hagen's designs are all about the details. A fashion designer from Delhi, India and studied at the University of South Florida, Sumita Bhojwani's clothes and designs derive inspiration from ethnic Indian culture and include a diverse blend of design elements from India with fusion wear also a significant part of her collection. Christian Fashion Week 2013 is the first fashion week ever created to showcase modest fashion and focused on the Christian market. Designers, regardless of worldview or religious affiliation, have been issued a challenge to create a clothing line for the modest woman without sacrificing style. The organization is now in discussion with over 160 designers from all over the world, working to narrow the selection down to just seven designers. There will also be a special woman-only swimwear show prior to the main event. Congratulation to CFW designer, Alma Vidovic, for Examiner Farrah Estrella's excellent article on her debut at Christian Fashion Week 2013! Special thanks to Farrah for an excellent and timely article! January 4 is the last day to win Zondervan's Christian Fashion Week Style Line Bible Sweepstakes. Don't miss it! Explore the latest fashion trends for men and women within the Christian community worldwide. The Sweepstakes will commence on November 12, 2012 at 12:00 a.m. The last entry will be accepted on January 4, 2013 at 11:59 p.m. (ET). As the date approaches, the CFW team moves into position, getting all the lights, models, designer information, and venue ready for the big day. It's been a wonderful year and we've received so much encouragement from the many fans of Christian Fashion Week. But, now it's time to shake things up and put on the show of our lives. The model auditions were so much fun. We met some talented people with runway-ready looks that we are sure will make New York proud. The designers are pulling together their collections this month in preparation for the first Christian fashion week in history. But, there is so much left to do and very little time to do it. Part of running a fashion week that is so niched as Christian Fashion Week means that you have to make sure you reach your core audience as directly as possible. For us, that audience consists of people of faith that have the disposable income to make fashion purchases along with, of course, anyone who is a fan of fashion. We have celebrity guests, ministry leaders, women's groups, and media all coming to see what we've put together. And, we think we are going to knock their socks off! So, the anticipation is building and all the pieces are slowly sliding into place as we get ready for the show of our lives. Come be a part of this historic event, and invite friends and family. Tickets are going fast and they will begin selling faster as the month goes on, so don't wait until the last minute to get yours. Come see the latest fashions from world-class designers from around the world - and bring your pocketbook to buy them right off the runway! GRAND RAPIDS, Mich., Dec. 20, 2012 - The first-ever Christian Fashion Week (CFW), a two-day event showcasing the latest fashion trends from both domestic and international Christian designers, is being held in Tampa, FL, February 8-9, 2013, and Christian Publisher Zondervan is helping one lucky pair get there in style. Now through January 4, 2013, contestants can enter to win a CFW prize pack including two VIP tickets to the event, tickets to the VIP Model4Jesus reception, a swag bag filled with door prizes and gifts, general admission benefits, roundtrip airfare to Tampa, a two-night hotel stay and a personal style consultation and a $500 shopping spree with Christian speaker, author, fashionista and image consultant Shari Braendel. "We're thrilled to be able to provide the opportunity for two individuals to attend the first-ever Christian Fashion Week event," said Amanda Costanzi, Vice President of Marketing, Harper Collins Christian Publishing Bible Group. "This event encourages women to let their inner light shine. For two days, stunning clothes and accessories, including the Style Line Bibles, will be featured on the runway. We stand behind the belief that Christians don't have to sacrifice their style or personality while representing their values in their dress and we're honored to be part of this unique event." To enter to win the CFW prize pack, visit Zondervan's Style Line Bibles website: http://www.stylelinebibles.com/contest.html. There, entrants can also explore Zondervan's recently released fashionable Style Line Bibles - God's Word designed to reflect a woman's individual personality and style. Style Line Bibles add flair to any outfit and travel well, easily fitting into a purse or bag. The nine unique Style Line collections offer a wide variety of designs, colors, patterns and accents that match beautifully with each woman's unique style. During the fashion show, models will be carrying Style Line Bibles down the runway as an accessory to their outfits. In addition, each attendee will receive a Zondervan Style Line Bible in their swag bag. Christian Fashion Week 2013 is the first fashion week ever created to showcase fashion focused on the Christian market. Designers, regardless of worldview or religious affiliation, have been issued a challenge to create a clothing line for the modest woman without sacrificing style. The organization is now in discussion with over 160 designers from all over the world, working to narrow the selection down to just seven designers. There will also be a special woman-only swimwear show prior to the main event as well as a boutique segment, showcasing ready to wear fashions already in stores and boutiques. Zondervan, part of HarperCollins Christian Publishing, is a world leading Bible publisher and provider of Christian communications. For more than 80 years, Zondervan has delivered transformational Christian experiences through its bestselling Bibles, books, curriculum, academic resources and digital products. The company's products are sold in multiple formats, worldwide in more than 60 countries, translated into nearly 200 languages. Zondervan offices are located in Grand Rapids, MI. For additional information, please visit www.zondervan.com.